Tired of being a stunt cat for El Gato, Mr. Puffball seeks out his fame on Feline Ninja Warrior. Soon, however, his fame is washed up. When he gets invited to Castaway Island reality tv show, he can’t wait to use his stunt abilities, wit, charm, and heart to win this survival challenge. Things aren’t what they seem on the show, however, and Mr. Puffball seems to be falling behind the competition. If he fails, he could find himself voted off the island. Will he succeed? Lively, funny, and engaging, the plot is well developed. The characters are entertaining and pull the readers into the story. The illustrations will appeal to people who have liked books like Diary of a Wimpy Kid. Readers who enjoy adventure, humor, animals, and reality tv will enjoy reading this book. Thank you for this wonderful review!! 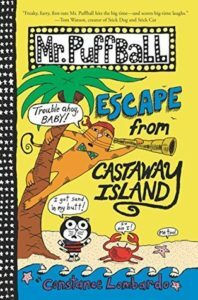 So glad you enjoyed Mr. Puffball’s adventures!